Cisco Switch usually is quite robust and not give me hard time. When it happens, it happens. What I met is a situation Cisco 4500 switch got into Rommon mode and I have to find a quickest way to get in back in production before the maintenance window ends. A switch reload or crash after the image was corrupted or deleted. See the Recover from a Corrupt or Missing Image section of this document for more information. The configuration register has been changed incorrectly. The configuration register value of 0x0 always brings the switch to ROMmon mode. The typical configuration register is 0x2102, with the boot system flash command pointing to the system image to load. Refer to this document for more information about the configuration register:The Configuring the Software Configuration Register section of Configuring the Catalyst 4000 Family Switch for the First Time. The boot variable is incorrect, but a valid image is still present. See the Recover from a Continuous Reboot section of this document for more information. Routing failures occur because ROMmon mode cannot route between VLAN interfaces, and is only designed to recover the switch. Could not find a valid file in BOOT environment variable. Rom Monitor variables, please type 'set' command. For help on choosing a boot method,  type 'confreg' command. 2.1 Connect Mgmt port on Cisco 4500 to your machine which Tftp server is running on. 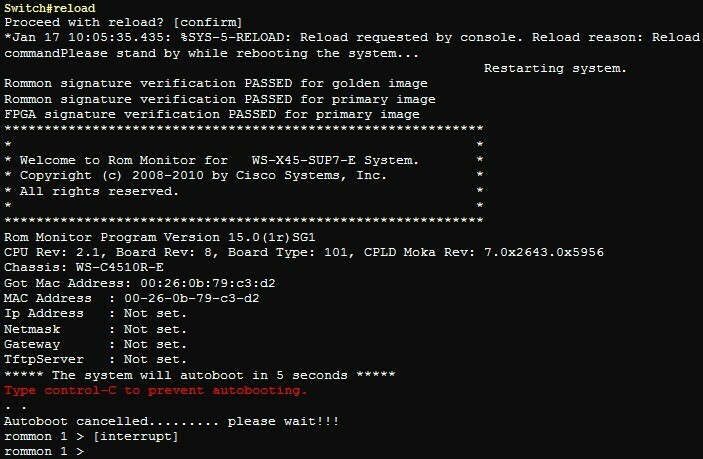 2.2 Configure Mgmt Port on Cisco 4500 with ip address 10.10.10.10. Put right IOS file (for example 4500.bin) under tftp server root folder. Invalid filename ?. It must begin with device name. Type 'boot -help' for details. rommon 12 >boot tftp ? - boots the first file from internal flash. - boots file "ios" from internal flash device. - boots file "ios" from compact flash device. "fa1 interface") using tftp file transfer protocol. netload mechanism and BOOTLDR program. No USB storage device detected! No SD storage device detected! The boot from TFTP server failed because of session timed out. Cisco Catalyst 4500E Supervisor Engine support external USB and Secure Digital (SD) card for flexible storage options. You wont be able to use new fast speed SD card. Cisco is selling this kind SD for more than $400. But it wont cost you more than $50 if you buy it from eBay or Amazon. No Mountpoints DefinedJul 17 19:44:58 %IOSXE-3-PLATFORM: process sshd: err                                                                                    or: Bind to port 22 on :: failed: Address already in use. Copyright (c) 1986-2014 by Cisco Systems, Inc.
Cisco IOS-XE software, Copyright (c) 2005-2013 by cisco Systems, Inc.
cisco WS-C4510R+E (P5040) processor (revision 2) with 4194304K bytes of physical memory. 511K bytes of non-volatile configuration memory.